Marathi /Marāṭhī/ (मराठी) is a official language of Maharashtra and it is also spoken in neighbouring states of Madhya Pradesh, Goa, Gujarat, Karnataka, Chattisgarh and Andrah Pradeshan. Outsite India, it is also spoken by Maharashtrian emigrants, especially in the United States, United Kingdom, Isreal, Mauritius, and Canada. Marathi literature began to grew due to the rise of the Seuna dynasty of Devgiri, who adopted Marathi as the main language. Adoption of the Marathi language by two main religious sects - the Mahanubhava and Varkari panthans - further give a rise to the growth and usuage of the language. During the reign of the last three Seuna kings, a great deal of literature in verse and prose, on astrology, medicine, Puranas, Vedanta, kings and courtiers were created. 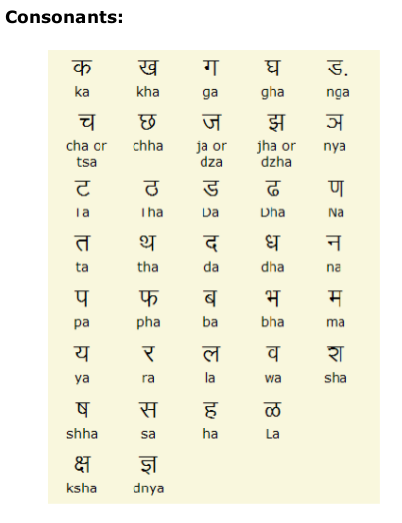 Nalopakhyan, Rukmini swayamvar and Shripati's Jyotishratnamala (1039) are a few examples. The oldest book in prose form in Marathi, Vivēkasindhu (विवेकसिंधु), was written by Mukundaraja. He bases his exposition of the basic tenets of the Hindu philosophy and the yoga marga on the utterances or teachings of Shankaracharya. Mukundaraja's other work, Paramamrta, is considered the first systematic attempt to explain the Vedanta in the Marathi language. Marathi gained prominence with the rise of the Maratha empire beginning with the reign of Chhatrapati Shivaji (ruled between 1674 – 1680). Subsequent rulers extended the empire northwards to Attock, eastwards to Odisha, and southwards to Thanjavur in Tamil Nadu. These excursions by the Marathas helped to spread Marathi over broader geographical regions. This period also saw the use of Marathi in transactions involving land and other business. Documents from this period, therefore, give a better picture of life of common people. The British colonial period saw standardization of Marathi grammar through the efforts of the Christian missionary William Carey. Carey's dictionary had fewer entries and Marathi words were in Modi script. The most comprehensive Marathi-English dictionaries was compiled by Captain James Thomas Molesworth in 1831. The book is still in print nearly two centuries after its publication. Jhadi Boli - Jhadi Boli or Jhadiboli is spoken in Jhadipranta (a forest rich region) of far eastern Maharashtra or eastern Vidarbha or western-central Gondvana comprising Gondia, Bhandara, Chandrapur, Gadchiroli and some parts of Nagpur and Wardha districts of Maharashtra. Southern Indian Marathi - Thanjavur Marathi, Namdev shimpi Marathi and Bhavsar Marathi are spoken by many Maharashtrians in Southern India. This dialect is stuck in the 17th century and is old Marathi – it did not change from the time the Marathas conquered Thanjavur and Bangalore in southern India. Varhadi - Varhadi (Varhādi), or Vaidarbhi, is spoken in the Eastern Vidarbha region of Maharashtra. Thanjavur Marathi - spoken in Tanjore, Tamil Nadu. Judæo-Marathi - spoken by the Bene Israel Jews. © 2017 (Easy Marathi Typing) - Type in Marathi. All Rights Reserved.